Not everyone is on vacation during July. If you’re teaching during the week of July 4th, there are a number of ways to tie the U.S. Independence Day into a language lesson. 1) The latest lesson in my vocabulary playlist focuses on idioms based on the colors red, white, and blue. A short interactive quiz is available to test comprehension. 2) Word forms of “free” would be another appropriate topic and more academic in nature. 3) Ask your students if they know what sound fireworks make. If they’re not familiar with boom, hiss, whoosh, or whizz, you might want to have them take a look at onomatopoeia. 4) Flags in general offer a springboard for vocabulary. For example, in my new video, I teach that blue represents perseverance. Could students find synonyms? How about determination, strength, or endurance? You could also see if students are able to find a more conversational equivalent: not giving up. In a class of international students, each could explain the key colors of their national flag and explain any new words using synonyms or more everyday wording. 5) Songs offer vocabulary, listening, and pronunciation practice. There are two directions you could go in, in terms of song choice. Traditional patriotic songs and patriotic rock songs engage students of different ages, and by no means do students have to be gearing up for the Citizenship Test to benefit from exposure to popular patriotic music. 6) A holiday word search could help bring in U.S. history, which would be particularly helpful background information for those new to the country. If this kind of activity seems suitable for your students, you might also check out the word scramble and cryptogram offered on Puzzles to Print. To those celebrating, Happy Fourth of July! 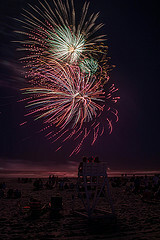 Photo credit: Fourth of July Fireworks – Avalon, New Jersey by Brian Holland. Retrieved from the Creative Commons on Flickr.